Does anyone use these adapters? If so, does this result in a truly robust solution? Any feedback is welcome, thanks. Sorry, the feedback was meant to my question only. All other solutions are well known and in use successfully for many years. 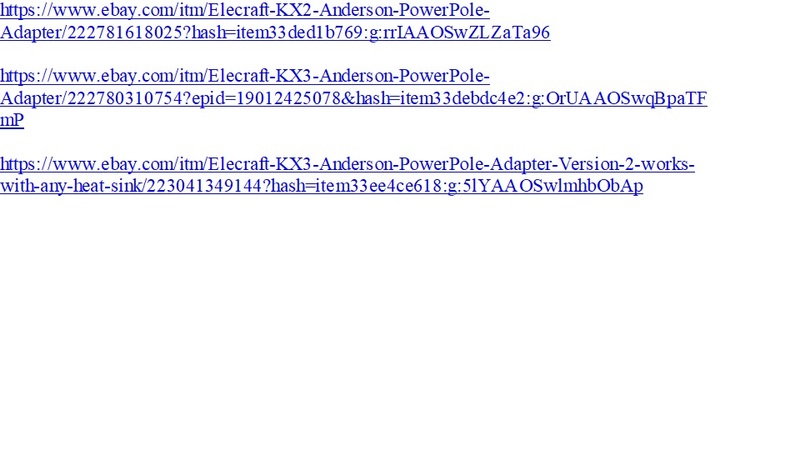 I crimped Powepole connectors on the end of my KX3 power cable. If you don’t have the parts and a crimper, you could order this cable. I might order one for my shack, actually. This 2.1mm right angle DC power adapter is the exact size for Kantronics TNC's. The O.D. is 5.5mm. The coaxial power plug connector is molded with 6 feet of 18 gauge wire and connects to any mating 15/30/45A Powerpole. IMHO a waste of money. Just put some Powerpoles on a fly lead. Job done.